About a week ago the idea for creating a blog post about a family heirloom, tradition or “treasure” was sparked by Patience Brewster, creator of unique gifts. This got me thinking about the many traditions, photos, books and other artifacts and memorabilia that I have been fortunate to inherit. And while I knew that I wanted to blog about this topic, I had a difficult time deciding which “family heirloom” to feature. My solution is to write a series of posts with this first one being about the antique castor set pictured below. Several years ago, when my Mom was going through some boxes she had stored away, she came across this serving piece and asked me if I would like to have it. I love antiques and thought this one was beautiful and unique and was quite excited about displaying it in my living room. My Mom remembers this being in her home when she was a little girl. It is silver plated and she told me that it was quite a pain to polish! (As you can see, I don’t bother with polishing it because I happen to like the pewter-y look that is has now.) She is a little uncertain about it’s origins, but thinks it was originally owned by her father’s grandparents. 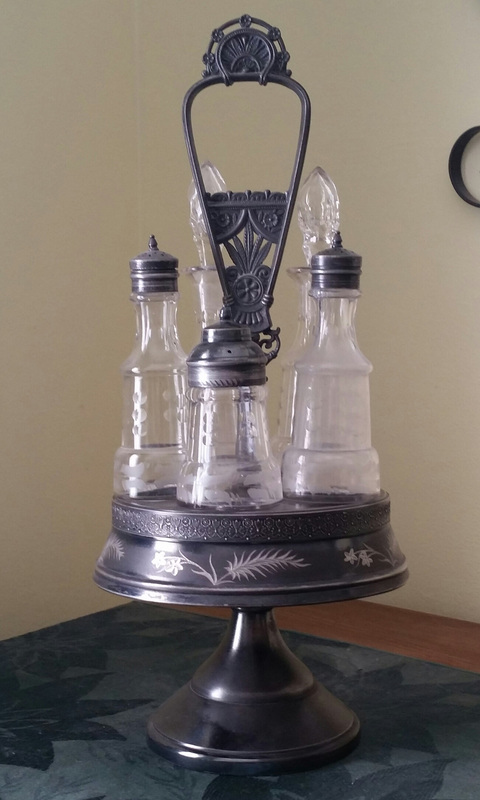 I have done a bit of research and discovered that it is an antique castor/cruet set. They were quite popular in the mid to late 1800s. They were used to hold condiments – oil, vinegar, mustard, salt and pepper. (Mine is missing the mustard spoon.) The base of the bottles fit into holes in the center section. That section rotates — kind of like a lazy susan. Their worth is based on the manufacturer and the designs etched in the base and on the bottles. And while my castor set is not particularly valuable, I still happen to think it is beautiful and love the idea of owning a piece that probably graced the table of my great-great grandparents!